I am going to disclose the holdings in my growth portfolio because I have been receiving questions as to what I am currently investing in (during the so-called bear environment). Readers ask what I actually own and want to know why I present stocks that I do not own. I will disclose my growth portfolio which consists of stocks that I anticipate will provide a rate of return greater than the general market averages and 90% of all listed stocks. I have owned shares in a couple of these stocks for a lengthy period of time. However, I will note that the size of the positions in MA, JASO and EDU have changed just as the market environment has changed. I have both added-to and sold-out of shares over the past 6-12 months. This blog is treated as an educational and equity research site. I am providing a portion of my own research in public while trying to help others based on the knowledge I have accumulated in the market. I research and study hundreds of stocks every week but I only buy a handful over the course of a year. Anyway, the six stocks below are all currently positions in an account I consider my growth portfolio (stocks can be held from a few weeks to a year). This account buys young innovative growth stocks that have the potential to provide returns greater than the vast majority of the equity market. It’s a long portfolio. I have other portfolios that buy options, ETF’s, value plays and short from time to time but this portfolio most closely resembles my research and writing style on chrisperruna.com. If you are wondering about this year’s losing trades (closed trades), most of them were sold prior to leaving for Mexico in late March (and I had several across the portfolios). 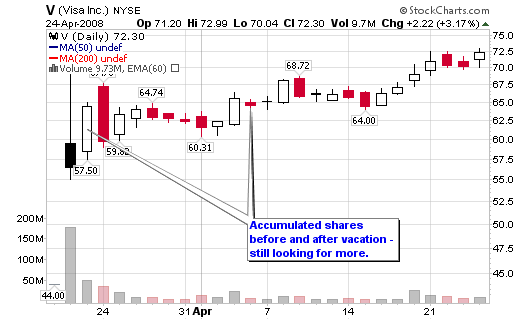 I am disclosing the positions because I am reevaluating the holdings while looking for new potential buys. Visa is the latest purchase and is up over 16% since accumulating my first batch of shares. I would like to buy additional shares in Visa once I determine how to reallocate the funds within the portfolio. Some new faces are popping up on my research scans and may be worthy of consideration versus the longer holdings and rebound plays. CPLA – 63.18, Capella Education; I bough this stock as a rebound play upon returning from my trip in Mexico. I highlighted it as a possible $60-$100 play back in February and have been watching it ever since. 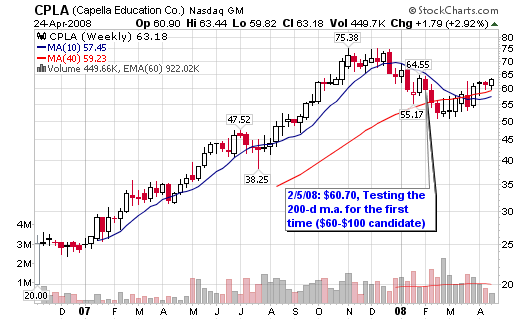 It will stay in the portfolio as long as it holds at or above the 200-d m.a. MA – 239.55, Mastercard; One of the older positions in my portfolio, MA is still giving me gains as it continues to trend higher. The ultimate mercy point or sell signal is a violation of the 200-d m.a. I will not liquidate the entire position until it drops below the 200-d m.a. on heavy sell-off volume. 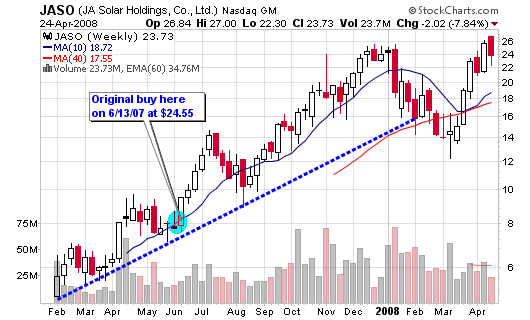 JASO – 23.73, JA Solar Holdings; A long time holding in this portfolio but it is a stock that I liquidated before opening a new position in recent weeks. The latest trade was based on a momentum signal rather than last year’s trend buying signal. I like the sector but it may be exhausting so I would like to find a new place to possibly park the money. 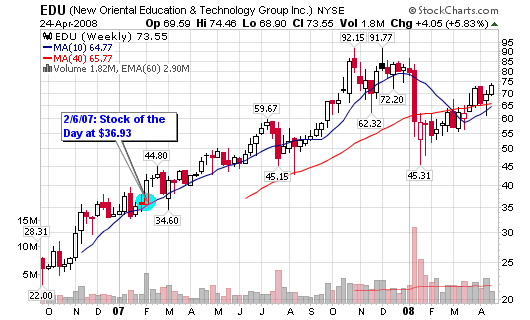 EDU – 73.55, New Oriental Education & Technology Group; I love the products and services this company offers. It teaches English to Chinese students (children and adults). The demand for this market is huge and EDU is at the forefront. I recently added new shares as this stock may have staying power based on its offerings and market. I am looking for a run towards $100 and a test of new highs. V – 72.30, Visa; I bought shares both before and after my vacation and I am hungry for more. Maybe I am crazy but the 0% credit card balance transfer/ purchase offers are pouring into my mailbox every day. I have always received these offers but it seems it has picked up in recent months. People are going to charge since their piggy-bank houses are no longer an option. Well, I didn’t base my buy on that assumption but it’s not a bad indicator. 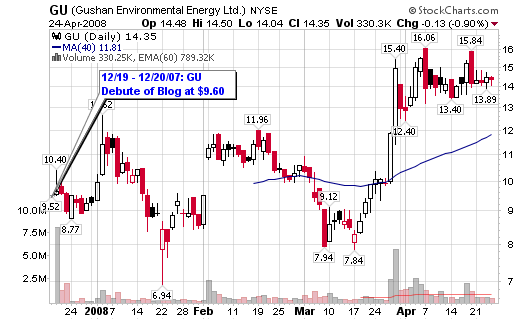 GU – 14.35, Gushan Environmental Energy; By far the riskiest stock in my portfolio in terms of name and perceived potential. Actual risk is capped to 1% of total equity but I will sell this sucker prior to a full loss if it starts to drop. I have already sold a position from earlier in the year when it turned against me but felt the need to jump back in for a potential longer term move. I don’t know if it will happen and wouldn’t be surprised if I was sold-out again; before the run I am anticipating based on my research. So there you have it – my actual growth portfolio. I wish POT was in my portfolio in 2007 but I missed that boat. Maybe IPI will become a solid momentum play. Some new stocks I am watching are TITN, IPI, SD, GTLS, PPO…among others that I can’t remember off the top of my head. 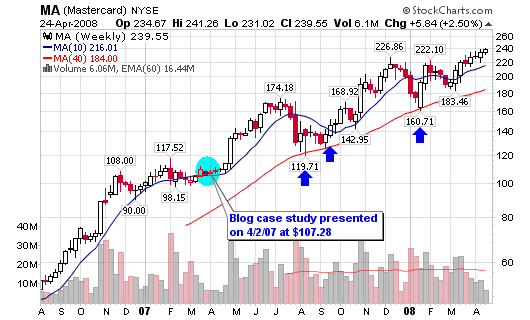 You may notice one thing: I buy the stocks I study the most and present on the blog. Your blog is very enjoyable, informative and easy to read. Thanks for all you do!! CPLA has that kiss-of-death 50d below 200d cross-under. That looks the riskiest of the bunch, IMO (EDU has it, too, but it looks like a bullish crossover is soon to occur). I agree about the movign averages. CPLA is a momentum play with a look towards $100. I don’t know if it will make but I like the risk/reward so I took the trade. EDU has been in my portfolio for many months so I have enjoyed both the good times (and they were good in 2007) and the recent bad times. I scaled out of EDU, only to start adding again. try to look at a 2 year chart with only the 200d leaving out the 50d and you may change your mind on whether this is a bullish or a bearish posture. I have been enjoying your blog for about 9 months now. Thank you, you do a great job. I empathize with the hard work you put in for us. I believe our investing styles are very similar…looking for great balance sheets, accelerating growth in sales and earnings, and to technically analyze the charts prior to entry and exit. William O’neil has shaped us well. Through your blog, I have discovered position sizing and Dr. Van Tharp. I have since read and listened to Safe Strategies for Financial Freedom and Trade Your Way to Financial Freedom. I am looking forward to reading his final book on electronic day trading; even though day trading will probably never be part of my repertoire. I would love if you could give me your insight on Digital Ally (DGLY). This post need not be for reproduction but I thought it fit your growth portfolio outlook. What do you think about GU? You stated before it was a buy at 12 dollars. I wonder how much of that is because China clean energy fell also. It’s hard for me to tell what the story is. Chris, this is exactly why you need to get on Covestor. Use just one of your portfolios and let the world know how good you really are! I would be the first in line to start following you. Cheers. I’ve checked it out and I am still deciding if I am going to allow access to my account to a third party. Giving out my username and password doesn’t sit right with me and that’s why I haven’t done anything with covestor, yet. I am trying to get feedback from a few people that use it or have used it. I stumbled upon your blog through my friend over at tradinggoddess.blogspot.com, and after looking through a couple of your recent posts I’ve added it to my RSS reader. I couldn’t find any contact information, I was wondering if you’d be interested in a link exchange with my stock blog over at wallstreetmatador.com. Thanks for your time, and keep up the great work! Does anyone use social picks? I believe it is similar with covestor.